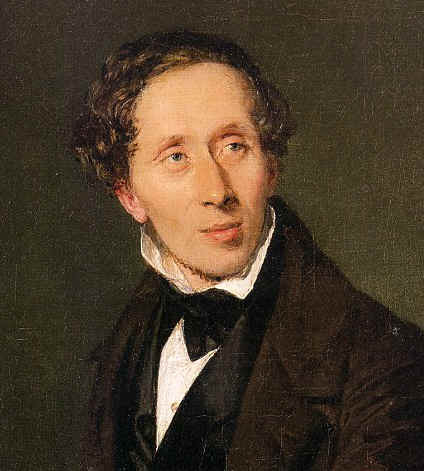 Imagine that you wanted to plan a celebration of the 200th anniversary of the 1805 birth of the great Danish poet, H.C. Andersen, born during the same year that his treasured Friedrich Schiller died. To understand the historical context for this small example of Mendelssohn's musical creativity, let us go back in time. The date is November 11, 1840. The place is Leipzig . The leading actors are H.C. Andersen, Felix Mendelssohn and J.S. Bach. After arriving in Leipzig, the 35-year-old H.C. Andersen walks toward the Gewandhaus concert hall for the purpose of meeting the famous composer Felix Mendelssohn, 4 years his junior. Mendelssohn had gladly accepted the post of conductor and musical director of the Gewandhaus, in order to have the honor of continuing the great musical tradition of Leipzig, established by his musical leading star, J.S. Bach. 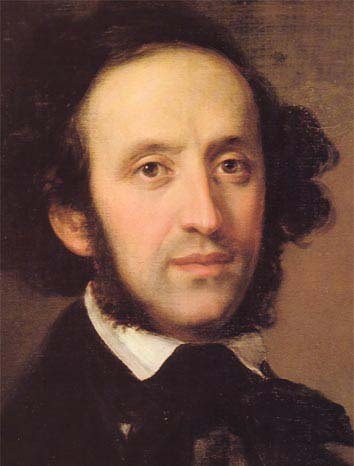 After all, ironically, it was the Jewish-born Mendelssohn, grandson of the great Jewish philosopher Moses Mendelssohn, known in his time as the "Socrates of Europe," who, in 1827, at the age of 18, was responsible for breathing life into the dusty, mothballed pages of the greatest musical work of Protestantism, Bach's St. Matthew Passion -- which had not been heard in the 100 years since its creation and first performance!. "... when he heard who I was, his face became so enlivened. He shouted loudly with joy, 'You have finally come to us! Our dear poet!' He asked me to listen to the rehersal of a symphony of Beethoven, the 7th, I think. Then he invited me to dinner, but as I had been invited to Brockhaus [a publisher of Andersen's works in German], I couldn't accept. 'Then I'll come to the Postoffice [where Andersen's stagecoach was to depart from] when you leave, and then we'll talk a little more!'" " -- When I was at dinner, there came a letter from Mendelssohn, to whom Mrs. Brockhaus had immediately written, to invite him to join me there, but he had company himself. I received a beautiful letter from him, and he had composed a little piece of music, which came with it, on the other side of the letter. In return, as he wished to have something from my hand, I gave him a copy of Hartmann's Cantata from the student organization, and wrote some words on it. Say to Hartmann that I think I have given his music to one of the most wortly...."
"\85da han h\F8rte hvem jeg var, blev hans Ansigt saa levende, han jublede ganske h\F8it: "Naa saa kommer De dog engang til os! vor kj\E6re Digter!" Han bad mig nu h\F8re Proven p\E5 en Symphonie af Beethoven, jeg tror den 7de; nu indviterede han mig til Middag, men da jeg alt skulde til Brockhaus [a publisher of Andersen's works in German] kunde jeg ikke. "Ja saa kommer jeg paa Posthuset, [where Andersen's stagecoach was to depart] naar De reiser og saa tale vi lidt mere!" 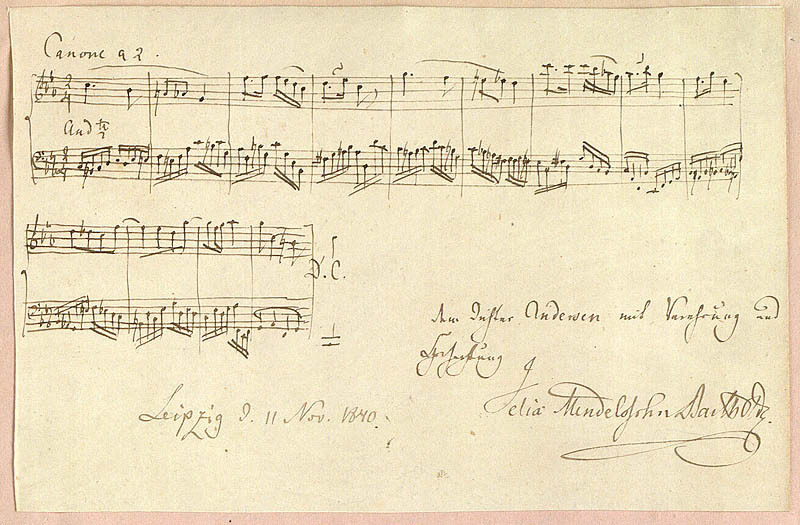 The music above, then, was the "little piece of music" ["lille Stykke"] that Mendelssohn gave to Andersen. Put yourself in the shoes of H.C. Andersen and his musical friends? Reconsider how you would play this musical gift. H.C. Andersen met the Schumann's in 1844, and according to one of his autobiographies, "From Weimar I went to Leipzig, where a truly poetical evening awaited me with Robert Schumann. This great composer had a year earlier suprised me by the honor of dedicating to me the music which he had composed to four of my songs; the wife of Dr. Frege, whose singing has enchanted so many thousands, was accompanied by Clara Schumann, and the composer and the poet were the sole audience; a festive supper and a mutual interchange of ideas made the evening all too short." After the performance, Mendelssohn said, "T\E6nk, at det var en j\F8de, der skulle genopv\E6kke protestantismens ypperste v\E6rk." K\E6rlighedens mange ansigter, H.C. Andersen, Jenny Lind og Felix Mendelssohn-Bartholdy, Bente Kj\F8lbye, Forum, 2002, pp. 46-47. H.C. Andersen; Brevveksling med Edvard og Henriette Collin, Bind 1, 1828-43, Levin & Munkgaard, K\F8benhavn, 1933, pp 290-291.